The second launch of BeiDou-3 GEO satellites. 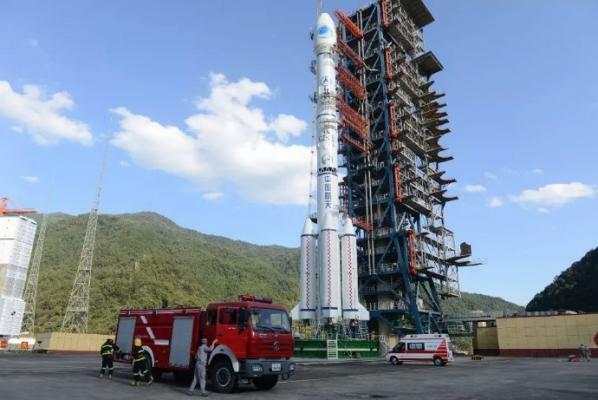 Re: BeiDou-3 G2Q - CZ-3B/G2 - XSLC - 2019? This may be the next launch from Xichang--see "Chinese launch schedule" thread discussion, starting here. A CZ-3B, with no YZ-1 upper stage, is assembled at XSLC. I think it's LC 2. That would be LC2 as LC3 has a crane on top of the adjacent service structure with no mobile service structure to assemble the rocket while LC2 uses the mobile service structure to assemble the rocket as seen in the above images. Also LC2 was used for the launch of the first BeiDou-3 GEO sat back in November of 2018. Have there been any NOTAMs for this launch yet? Not yet, and looks like the launch was postponed. Don't know the reason. The discussion up-thread of the LV on LC2 could have been for Beidou-3 I1Q instead; discussion thread here. .....and these are standard GTO trajectory drop zones, not the 55 degrees inclination we have expected.